Google has released an update (version 2.1) to its highly-popular Google Translate for Android, which adds text-to-speech (TTS) spoken language support for 3 new languages, namely Japanese, Korean and Arabic, in addition to the current 21 supported languages. Besides, the Google Translate for Android also enhances the quality of TTS function in over 15 languages including Russian, Portuguese and Chinese. Furthermore, the comprehensive and simple-to-use mobile translating app that supports spoken translations in 24 languages also allows users to easily, instantly translate text-to-text between 58 languages. The version 2.1 also marks the introduction of support for Google Translate alpha languages, namely Armenian, Azerbaijani, Basque, Georgian, Latin and Urdu. 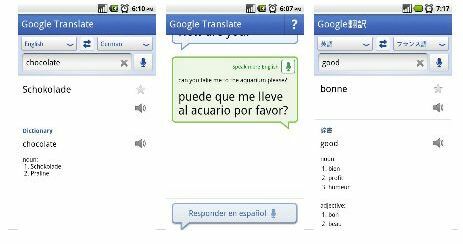 The latest version of Google Translate app for Android platform is now available for free download from Android Market.